H.14277 -Boater's Paradise with access via Vanderbilt Lagoon to the Gulf of Mexico. Bike to Naples Beaches to unwind in the beautiful sunshine or watch for dolphins. Minutes to Mercato's night life and restaurants. Or, maybe just sit out back and watch a gorgeous sunset, night after night. This three bedrooms plus den, two full baths, two-car attached garage 1,979 square feet home situated on a lot with 80 feet of seawall complemented with a 400 square feet dock that includes a 10,000 lbs. 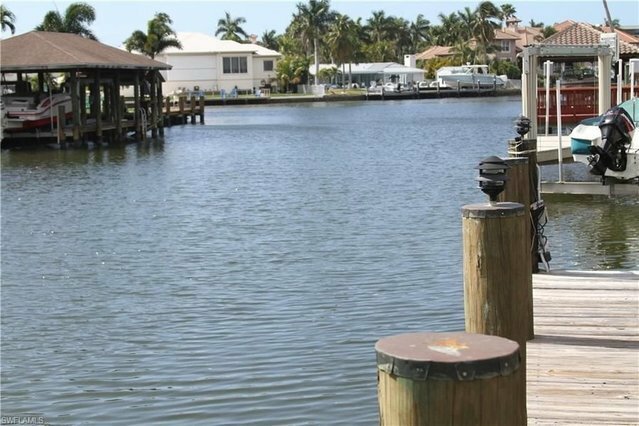 boat lift offers so many Owner Options: move in and enjoy all that Naples has to offer; use as investment property since this home has had the same annual tenant for multiple years; or build your dream custom home on this perfect southern exposure waterfront property.